Dringen Sie in das Herz des Dschungels ein, um auf diesem Abenteuer für einen Nachmittag die Mayakultur und andere Aktivitäten zu erleben. Beginnen Sie den Tag mit einer Läuterungszeremonie der Maya in einem Dorf der Gegend, bevor Sie sich zu Fuß durch den Regenwald zu einem riesigen unterirdischen Netzwerk von Flüssen aufmachen. 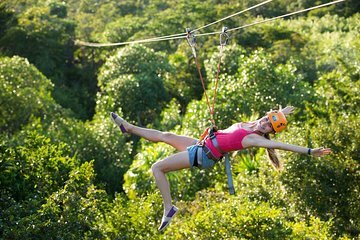 Schnorcheln Sie durch seine Gewässer und Höhlen, bevor es mit dem Geländefahrzeug zu Ihrem nächsten Abenteuer mit Seilrutschen und Abseilens geht. Entspannen Sie sich vom Nervenkitzel mit einem Mittagsbufett aus traditionellen Gerichten der Maya. Der Transfer ab und nach Playa del Carmen ist inbegriffen. The Cenotes were absolutely gorgeous. Pepe picked us up and our adventure started. He was very informative and fun. We did 5 ziplines, one of them going right into the water. We also repelled into one of them with great instruction from Pepe. The snorkeling was beautiful!!! The staff also took so many pictures that we were able to purchase when finished. Lunch was a very nice and yummy selection of foods. We loved it. I highly recommend this tour. There were only six people in our group plus our guide, Pedro. The location was great - not crowded and didn't feel too touristy. Pedro was fun and a great source of information. It was great to have some adventure in the midst of a relaxing beach vacation. The cenotes are beautiful and being able to rappel into one and snorkel in one should be something you add to your bucket list. No sunscreen is allowed - not even biodegradable sunscreen. You are in shaded areas or cenotes most of the time so it wasn't an issue, but just an FYI. You are allowed to take a hat and sunglasses and that is it. No phones, handheld cameras, etc. They do allow a gopro if it is strapped on your head but honestly, with the activities you are doing, it would be pretty impossible to take cameras, phones, etc. They take lots of photos and a couple of videos. Of course, you have to pay for those if you want them at the end of the tour but, trust me, you will want them! You can purchase a USB drive with everything included for 70. This is a GREAT tour. Muy recomendable el tour a los cenotes fue una experiencia muy buena.